When you move into one of our Spring luxury apartment homes, furnishing it can involve a lot of time, effort and money. You might want to consider renting furniture as an effective solution that is a better fit for your needs. 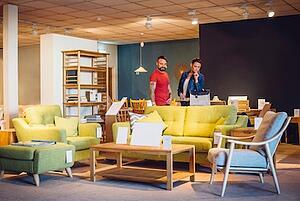 Is Renting Furniture the Answer for You? Your current furniture may not be worth the cost of moving it to a new apartment. If you're in military service or another job that requires you to relocate frequently, renting furniture can be a good short-term solution. Renting allows you to have a fully furnished apartment without the budget-busting expenditure of buying. Do you like to change styles frequently? Updating decor is easier with rented furniture that's removed and delivered by the store's crew. If you're moving into your first apartment, renting furniture gives you time to discover your own individual style. So you've decided renting furniture is the way to go. You may be surprised to learn that it doesn't have to be all or nothing. Several options are available to accommodate any budget, style and need. Some apartments come fully furnished, so they're move-in ready and you don't have any additional payments. The downside is that you generally don't have any say over the style and types of items. Whole-home packages give you more flexibility over what's included and they're usually delivered and installed within 48 hours, giving you a completely livable home with no muss or fuss. If you're upgrading to a larger floor plan, a whole-room package may be the way to go. For instance, you can move from a one-bedroom apartment to a two-bedroom apartment and rent a full room of furniture for a guest room or office, depending on your planned use. Just want to fill in some bare spots? You can even rent furnishings by the piece, from beds and dining room sets to rugs, throw pillows and bedroom linens. In addition to completing your decor, this is a great way to "test" accessory styles before purchasing. Do you have a favorite furnishing or accessory you can't do without? Tell us in the comments!